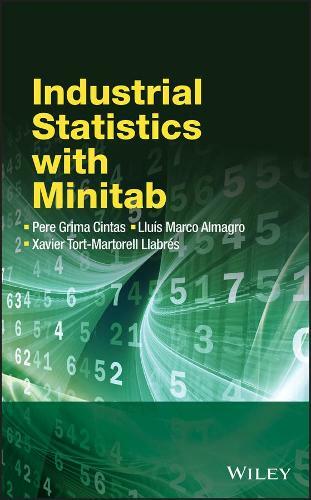 Industrial Statistics with MINITAB demonstrates the use of MINITAB as a tool for performing statistical analysis in an industrial context. This book covers introductory industrial statistics, exploring the most commonly used techniques alongside those that serve to give an overview of more complex issues. A plethora of examples in MINITAB are featured along with case studies for each of the statistical techniques presented. Industrial Statistics with MINITAB: * Provides comprehensive coverage of user-friendly practical guidance to the essential statistical methods applied in industry. * Explores statistical techniques and how they can be used effectively with the help of MINITAB 16. * Contains extensive illustrative examples and case studies throughout and assumes no previous statistical knowledge. * Emphasises data graphics and visualization, and the most used industrial statistical tools, such as Statistical Process Control and Design of Experiments. * Is supported by an accompanying website featuring case studies and the corresponding datasets. Six Sigma Green Belts and Black Belts will find explanations and examples of the most relevant techniques in DMAIC projects. The book can also be used as quick reference enabling the reader to be confident enough to explore other MINITAB capabilities.